For The Village Guru website, I mostly write about decor and staging related articles. 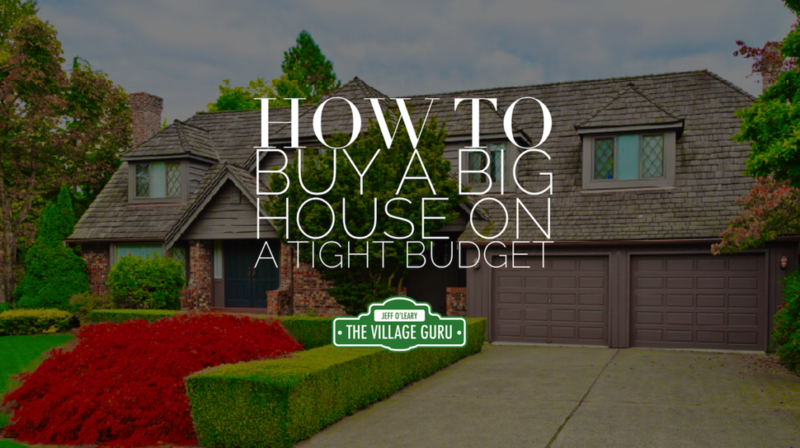 I was inspired to write this article about How to Buy a Big House on a Tight Budget because I’ve watched Jeff work with many buyers who desperately want more space in their next home. In some cases, these ideal-minded, hopeful clients, slowly but surely price themselves out of this bigger home, waiting for their dream to appear in their budget. Jeff tries to show them options that would get them to their long term goals, but they just can’t “see it”. It’s not the dream they wanted, so they wait, and wait, until either they get creative about what they can afford, or they aren’t willing to compromise and never achieve their goal. This article is my effort to try to help buyers take the emotions out of the buying process, to look strategically at these homes for sale with a pragmatic vision. I know every buyer wants to feel that magical, warm & fuzzy feeling, and are often distracted by pretty cosmetic finishes. I know this, because that’s my job the create this feeling as a home stager. But many homes have the opportunity to be your dream home, and myself and The Village Guru will help you every step of the way. 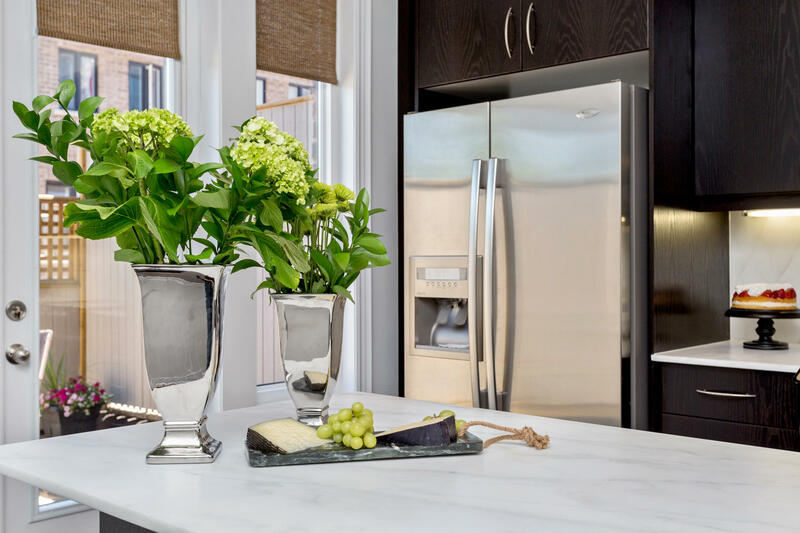 In today’s real estate market, you had better believe that design and finishes have a big effect on the price of a home. I think we all know it, but we don’t want to admit it. Just like most other women, I naturally head straight for what is most important to me when looking at homes; I want to see the kitchen. After that, I’ll evaluate the layout of the home, and then the other finishes like the floors and the bathrooms. For me, these factors are what make the house sing, or make it cry for help. It’s the finishes that give you that “feeling”, that sense about the home that you can’t quite put your finger on. This is why when we’re selling homes for clients, we spend so much time and effort on the kitchen and other cosmetics so that buyers come in and get that “good vibe”. When you get buyers to connect emotionally with a home, you get the most money for the home. But what about if you’re the buyer? And what if, as is very common these days, you are a buyer on a tight budget? Below are your 2 most common options. Most home buyers first instinct is to buy a turn-key home, where everything is already done. Going this route can provide you with the peace of mind that you won’t have to fork out sums of money to fix it up; all those upgrades are rolled into the price of the home. You can have your friends and family over right away to enjoy your new home that you’re so proud of, and there’s nothing wrong with this at all. Just keep in mind that buyers will always pay a premium for a turn-key home, and the sacrifice, when budget is fixed, is the size of the home. If you’re more concerned about getting the most home for your budget, and increasing your long term equity, then you should concentrate on getting the biggest house you can afford. While back splashes and counter tops can be changed relatively easily, it’s very hard to increase the size of your home. 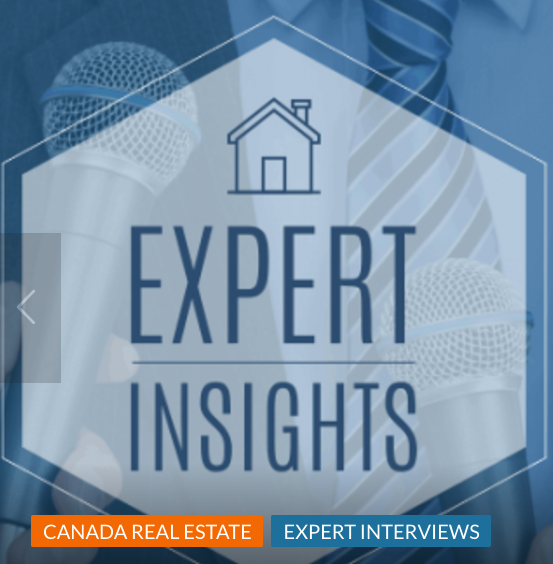 For buyers who see real estate as a long term play, and are willing to get creative, there certain strategies will earn you more money AND get you in your ideal home much faster. 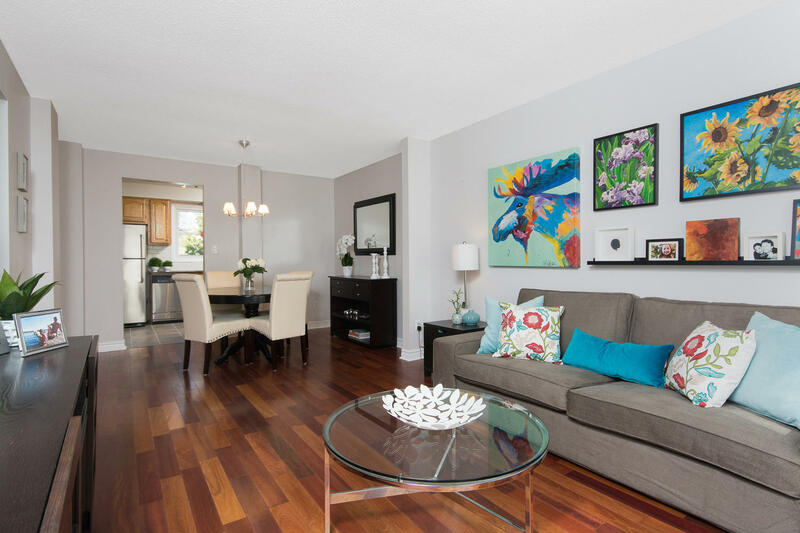 Below are just some of the benefits of focusing on larger home over décor. Buying a bigger home reduces how often you will need to move as your family grows. If the process of selling/buying causes you major stress, then this is the first good reason to buy bigger. If you’re planning on staying more than a few years, you can make smart, quality decisions about your home, as you will be the main benefactor. When people think they are moving soon anyway, they don’t often make the best investment/repair choices. After location, size is the biggest determination of value. If you can find a big home that is undervalued due to lack of upgrades, then you stand to gain better equity and make more money in the long run. If your goal is to buy a big house on a limited budget, you need to focus on the diamond in the rough. This means a well-loved, well taken care of home. The mechanics are good, and the home should be dry. You should be looking for the right layout, and not worrying about that fact that it’ll most likely be Ugly As Sin. You may not get that “I-want-to-live-here!” feeling right away, but that’s ok. When you do find this type of house, and they’re always out there, jump on it. 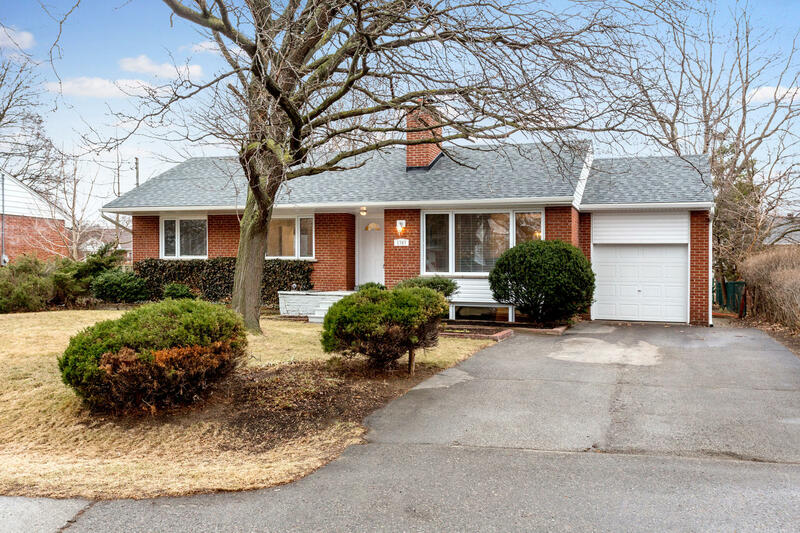 You’ll know because it’s the house that all other buyers are saying “meh” to. Do these Photos Make you Feel “Meh”? or “Ugh!!!”? Good. The reason you have the best chance of getting these homes undervalued is because most buyers are reacting emotionally to the home, instead of practically and logically. Everyone is thinking, “No way, I’d need 80k to fix that up before I could even step foot it in!!! !” Buyer demand is lower because most buyers have the same fears. They don’t want the headache, and they don’t know how much it will cost. It’s not a house they can show off and entertain in. It’s too much work. With all of these negative emotions swirling and growing in buyers’ minds, these homes are not getting bought as quickly anymore. They are harder to sell, while “pretty homes” are still getting snapped up quickly. This gives you opportunity and advantage, if you are willing to put aside the emotions, and consider a practical strategy of attack. But there’s no way I even have the time to take on a project! That may be very true for you, and then you need to assess your goals. But I’ll fess up about me. I waste time more often than I would like to admit. I find myself popping into HomeSense to browse around, or I watch just a few extra episodes on Netflix. Or I check Facebook 1001 times some lazy Saturday afternoons. If you really think about it, most of us probably have 5 hours a week that we waste on nothing important. If we spent that time working on our house, how much could we accomplish? An incredible amount. With any goal; losing weight, eating healthier, learning a new skill, getting your dream home – we make time for what’s most important. If you’re like most people, your major hang up will be not wanting to live with the old owner’s expired style. You want fresh and new, not dingy and dated. So, with a good plan, a schedule, and a lot of paint, you can turn that house into your dream home. This is an option if you have a house you are selling. 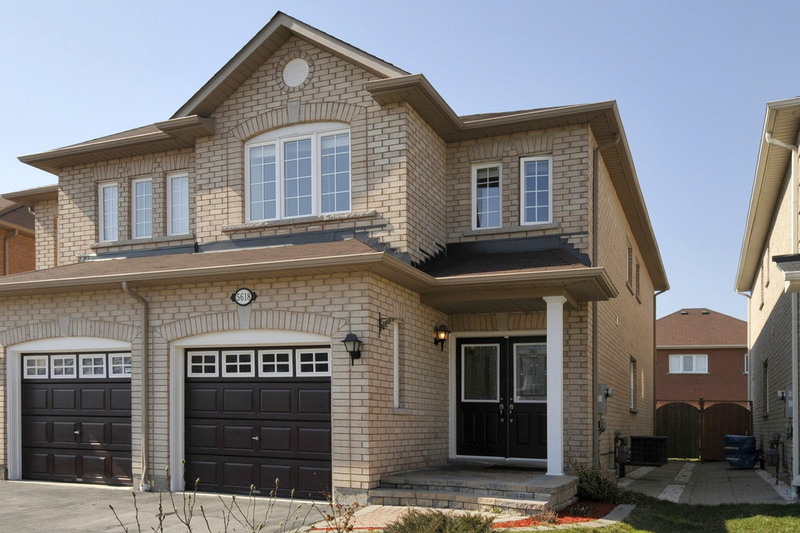 This allows you to get ownership of the new house 1-2 weeks before you close on your old one. This will give you the time necessary to make the house livable before you have to move in. I assume that you are reading this long before you’ve offered on a home. Talk to your boss, share your plans, and try to build up as much time as possible to use during that 1 or 2 week period. Can you work 1/2 hr longer each day, work through your lunch, build lieu time? Try to find ways to accrue time that you can use during that bridging period. I know there’s a lot of costs for moving; hard cash costs that come straight out of your pocket. So the more time you give yourself to plan, the better off you will be. For your new home, if your cash is already tight, all you need are some Rona or Home Depot Gift Cards. Garage Sale: Purge Purge Purge. I find the most successful locations for selling are Facebook Marketplace and Facebook Buy/Sell Groups. There is also Varage.ca. Actual garage sales and Kijiji have a lot more haggling, which I don’t like. I put my stuff for sale at 60% off retail value, and people buy it. Once you start selling, it can become addictive. 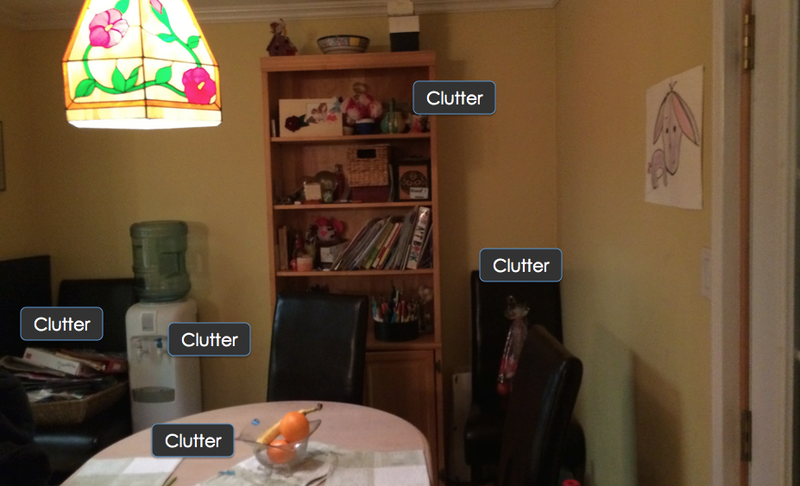 Some days I find myself wandering around the house, looking around rooms and in my closets……is there anything I can sell today?? If you have your bigger goal in mind, you will start wanting to sell things you’ve been hanging onto for no good reason. Do you Have a Skill You Can Offer? Welcome to the part time economy! Practice carving out those 5 hours a week by selling crafts or offering services via a Facebook page/Facebook marketplace/word of mouth. Many of my friends take orders for custom wood signs, key hooks, children’s growth charts, custom pillow or bags, etc. Or they provide bookeeping, cleaning, senior companion, driving, or other services. Some friends sell duTerra, Arbonne, Avon, Sweetlegs or 31 bags on the side. Whatever your passion, you can start making a little extra money on the side. Not enough to necessarily increase your home buying budget, but enough to ease the costs of moving, which can come as quite a painful event if you have not planned or saved for it. Gift Obsessed: If you are a family that gives gifts for birthdays, Christmas, etc, then let all of your family know your plans and ask them to help you reach your goal. They can give you gift cards for Rona or Home Depot and that’s money you never would have had othwerwise. If you have Scottish family like me, who don’t like to give cash as gifts, then get them to buy you cans of plain paint, which you can have tinted later. Or brushes and trays and painters tape, etc. Sounds silly, but it all adds up. If buying a big home is your dream, then with some help from people who love you, you CAN make it happen. Many people feel the need to take on life’s big challenges by themselves. It’s very hard for many of us to ask for help. But when you are reaching towards your goal, help can mean the difference between success and failure. Let friends and family know about your goals. Share what you’re doing and why, and get people connected to your story. If the people who care about you better understand your journey and dreams and struggles, they will be far more interested in helping out. Ask ahead of time who can spare a day or two to help you with the house to get it ready. You don’t have to know what house. You could still be searching for a few months. But get it in their minds. Once you do know the closing date, firm up with everyone you can. Getting people to actually put a date in their schedule makes it 100% more likely that they will follow through on it. Be sure to bribe them with promises of yummy food and drinks and treats. Chances are, most people will offer to help on a Saturday, which is wonderful, but having 30 people in your home in one day may create more chaos than help. You may luck out if you can ask closer friends and family to come during the week. Once you know exactly when everyone can come, you can plan tasks accordingly and ask them what they can do best – clean, paint, etc. Most people will stand around without a clue what to do if you don’t instruct them. And no one will be happy if they set aside a day for you and they ended up feeling useless or unnecessary. So do everyone the respect of writing up a master list of tasks, plus any specifications around the task, (who, what, how, when, where) and cross out as you complete them. That 1 – 2 weeks bridging period is your best shot at making some major visual changes. I offer my design services as gift to our buyer clients, and I make a detailed makeover plan that will transform your home. Contact us at any time to learn how we help you every step of the way on your home buying journey. 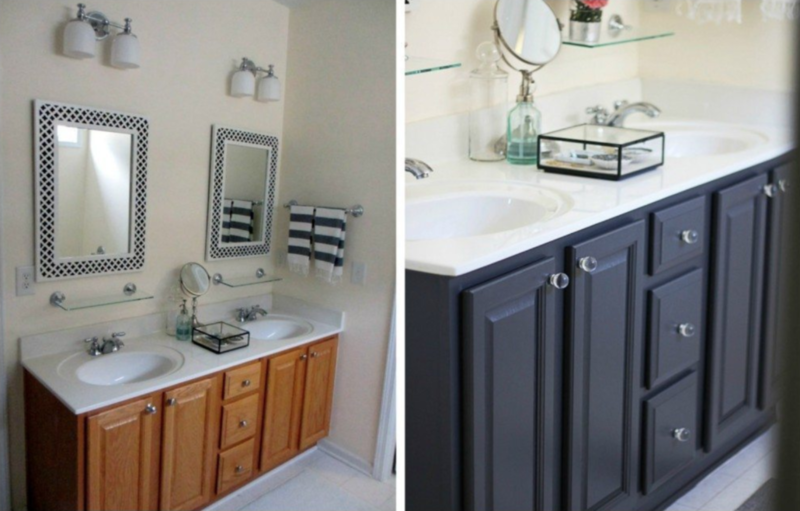 In most cases, the easiest and cheapest way to immediately transform your home is to use various white paint products to hide all the ugly stuff, and then bring in colour through wall paint and accents. There truly are new, remarkable product these days that are durable, high-adhesion, and even low VOC, so you won’t kill too many brain cells in the process. Depending on how much you saved and what your new house needs, here is a list of what you can do to immediately transform your new home. Think Young House Love, Remodelaholic, and Centsational Style. You can do this!!!! 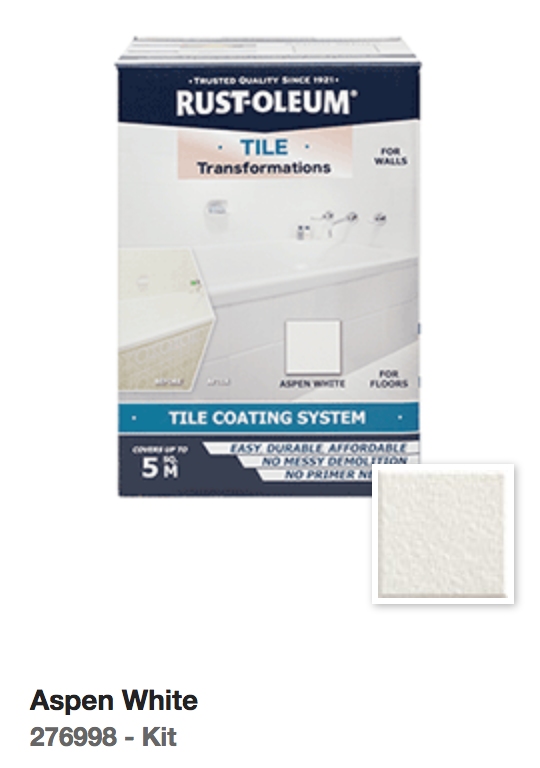 Rustoleum has a great tile product that will cover over any and every hideous tile you have. It lasts for about 2-3 years and may then require some touching up. This product is GENIUS in being able to extend the life of a bathroom or kitchen until you want to do a gut job. Stick to white, as it is the most realistic looking (because of the grout lines), and then add colour elsewhere. 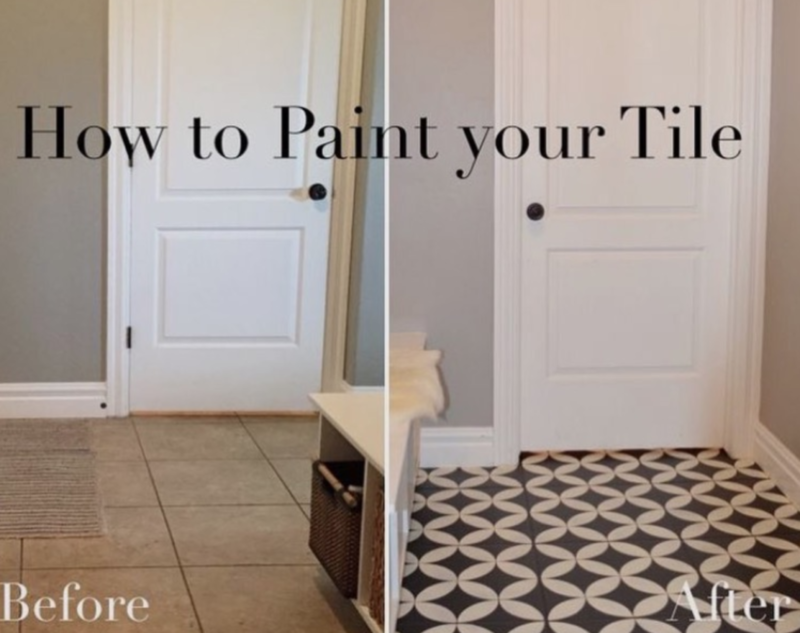 Check out this blog from Pink Little Notebook to see how they fared using the Rustoleum Tile Transformations. Most people don’t realize you can also paint floor tiles. I wouldn’t recommend this all the time, anything on a horizontal plane will get more wear and tear and break down over time. In a heavy-use bathroom, I would sooner throw down a cool geometric or floral entry mat, that covers as much of the tile as possible. Choose one that can handle the moisture and not grow bacteria. However, the tile in the front foyer might be just hideous and you can’t help thinking how terrible it is. Maybe you have a powder room you’d never want your guests to see. If this tile is becoming a deal breaker for wanting this otherwise great house, then go ahead and paint it out. 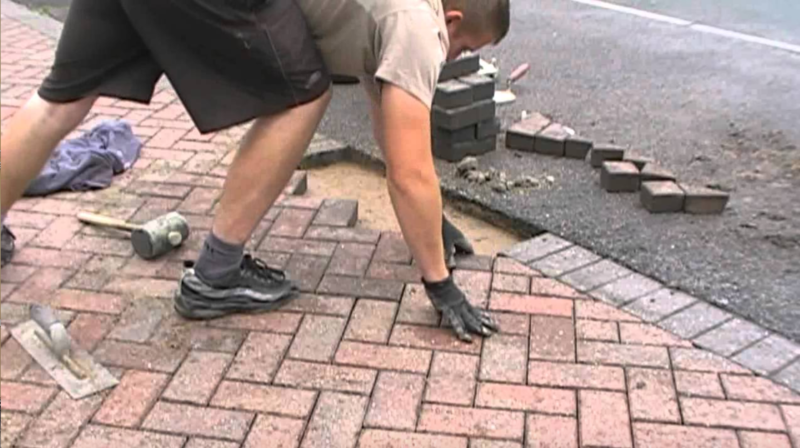 This is a good project for a workday AFTER all the big helping crowds have come and gone. The more you can allow the products to cure before regular use, the better. Expect the finish to last 2-4 years until you need to touch up worn areas. Immediately lay down attractive mats where you know the floor will likely get intense wear. 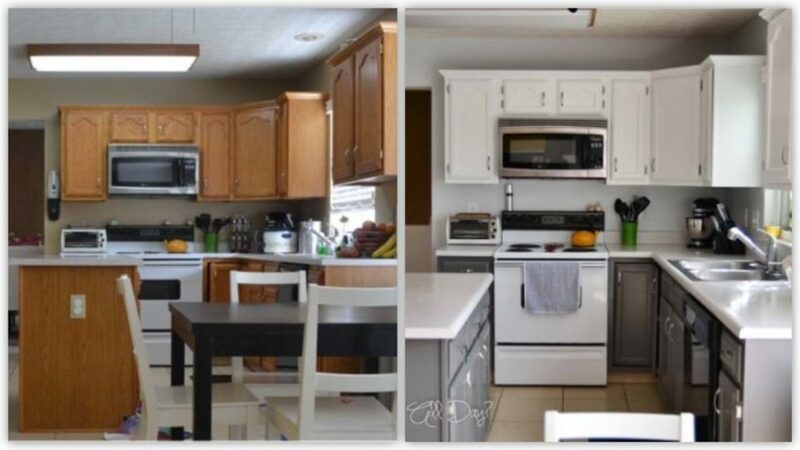 Often, tile runs from the foyer to the kitchen, meaning that if you want to get rid of the floor, you’re also messing with the kitchen cabinets. If they both need to be replaced eventually, budget to do them at the same time. Choosing black or white paint will create a classic contemporary look, depending on the other floors and elements in the home. Take a minute to read this post by Remington Avenue, and another from Design Sponge where the floor was painted with high adhesion paint and a Polyurethane topcoat. I think this is the best option, and if you’re willing to go that extra step and do a stencil pattern, even better. 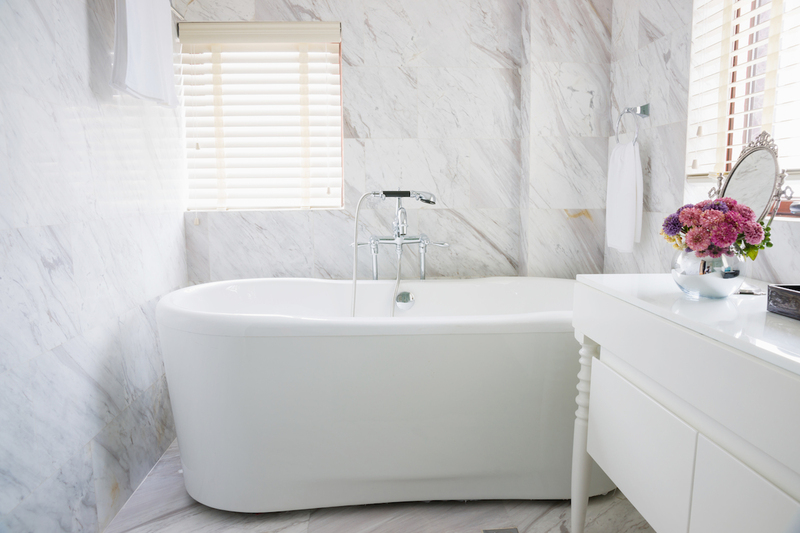 It will give your floors that fresh look until you’re ready to tear the tiles out for good. Below are some more inspirational photos. 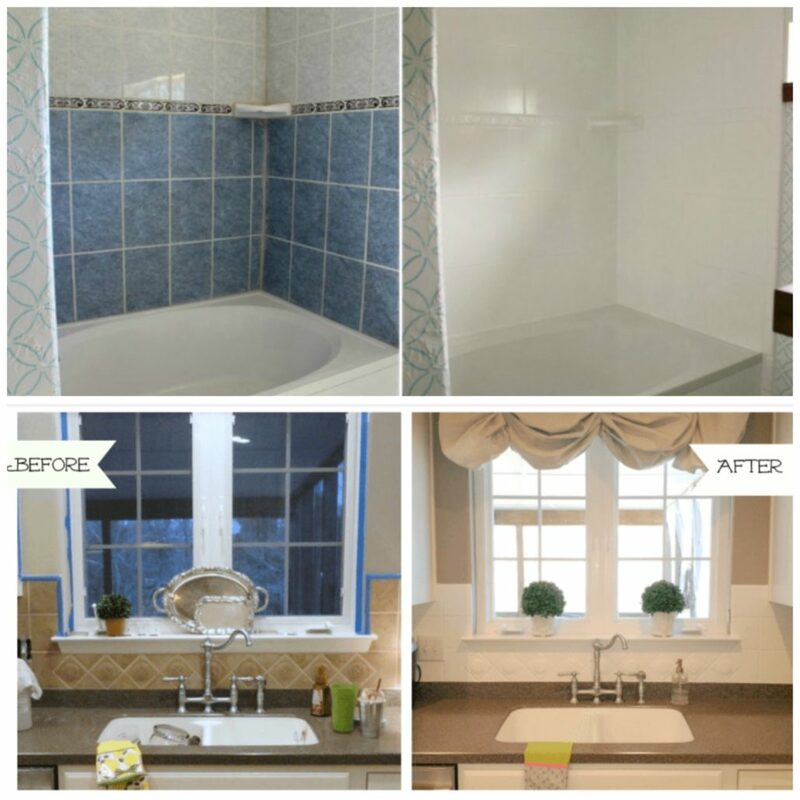 With 1-2 people over 2-3 days, you will transform any space that has horrible tile, and make it look fresh and very stylish. Never be thrown off by honey oak, pickled pink, black walnut or pine cabinets. 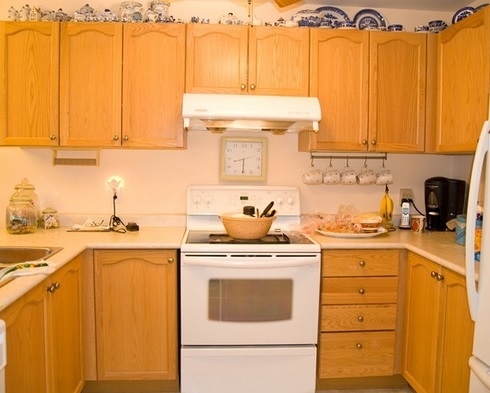 For any kitchen in need of renovation, a buyer will assumes a cost of at least 30k to fix up. But if you have $300 in supplies, and 2-3 people working over 2 days, you can give any kitchen a fantastic first impression. 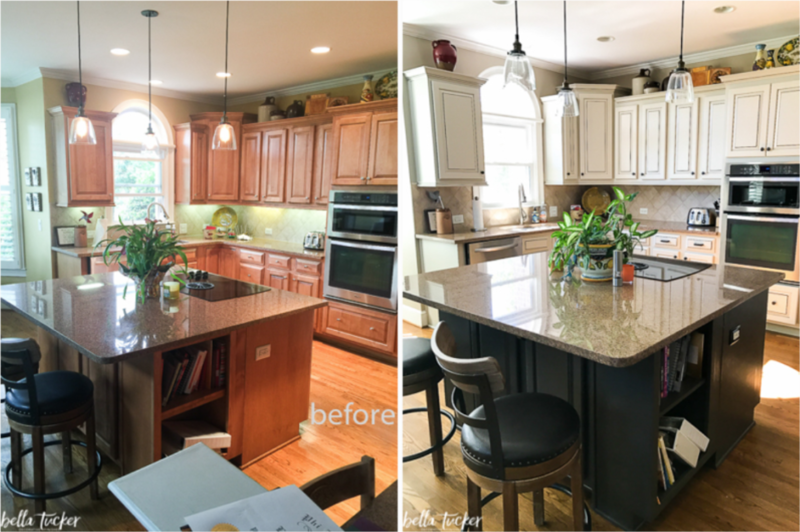 Especially when refinishing cabinets is combined with other suggestions such as painting tiles, new lights, and a countertop refresh. If you have the budget, it’s wonderful to have the cabinet doors professionally sprayed, from companies such as Paint it Like New. You will get a top notch sprayed finish. But, the second best option is to find one friend who is a sanding phenom, and one friend who is a meticulous painter. These two people are worth their weight in gold, because the only thing that will disappoint you about a painted kitchen is a sloppy finish. I would rip out every inch of carpet in a house, no matter if I had $10 or $10,000. It holds odours, dust, other allergens, and makes me sneeze endlessly. Frankly carpet is just gross and I will never live with wall to wall carpeting ever again in my life. 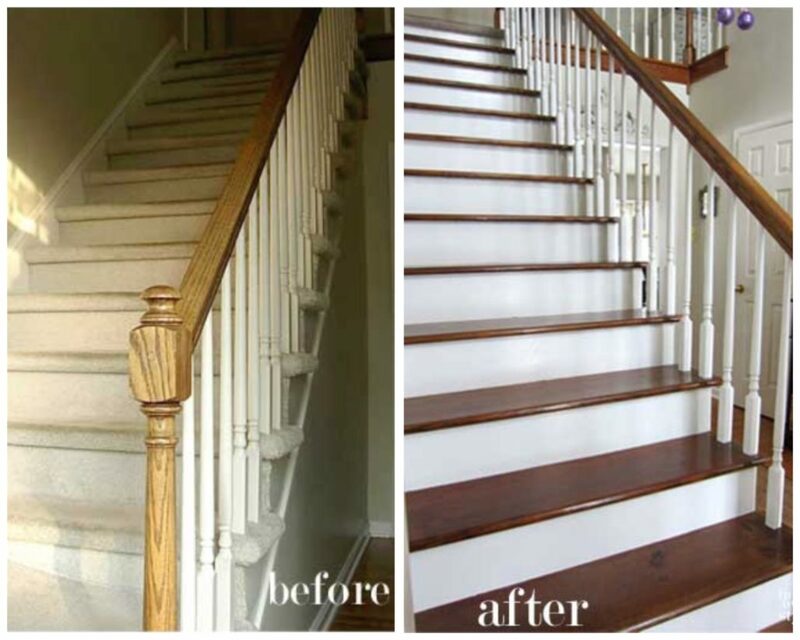 You can split the cost between upstairs and downstairs, because as long as the 2 woods are similar, if not even an exact match, the stairs will separate the two and you can achieve a stylish look. But never chop up your main floor into different woods, you have to buy enough to cover the entire carpeted space. Choose a neutral, matte, mid tone walnut wood. Trends swing from dark ebony, to light blond maple, then to distressed grey, because as we get sick of one extreme, we then move to the other. But the classic ash-brown walnut tone will never go out of style and can compliment any design taste. Even try to hold off on too much hand-scraped distressing, as this craze will eventually go out of vogue as well. 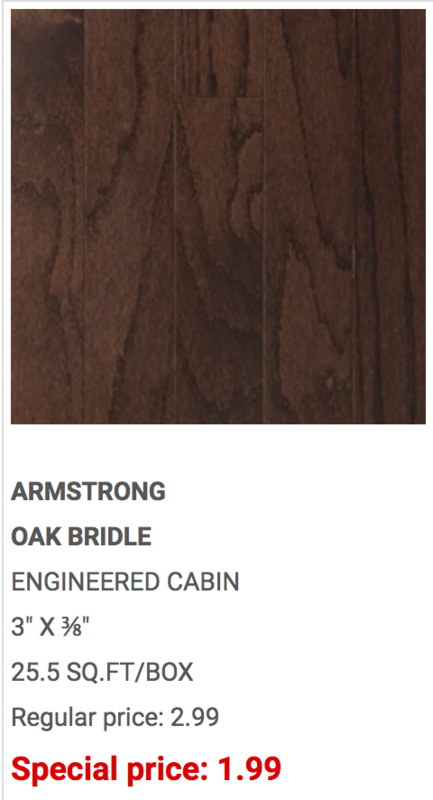 There are some laminates that look deceptively like wood now days, they even come in various lengths to really mimic wood. But the truth is they only have a limited lifespan. The top will wear out, and it cannot be refinished like wood. 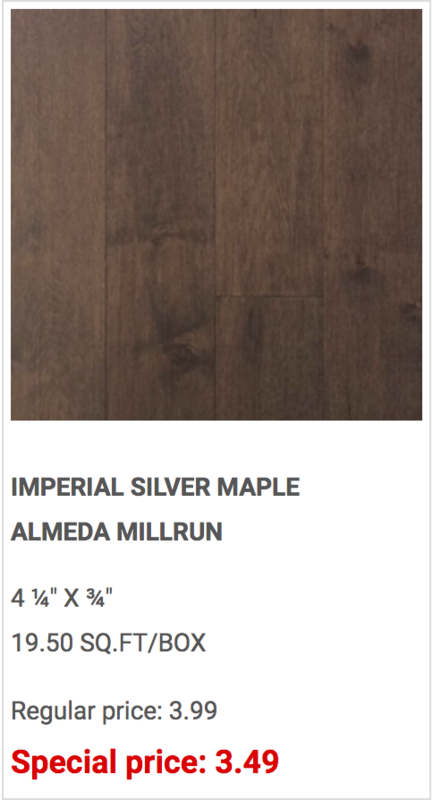 So if you can budget laminate and are prepared for the fact that you will need to re-do the floors in 10-15 years time, then you will get the enjoyment out of a stylish wood-look floor. You can also rip out the carpet, give your sub-floors a good sanding, making sure there are no staples or nails, lightly fill the seams, and then paint them with the same 3-step process as a tile floor. It may seem crazy, but in my mind, it’s still better than wall to wall carpet. 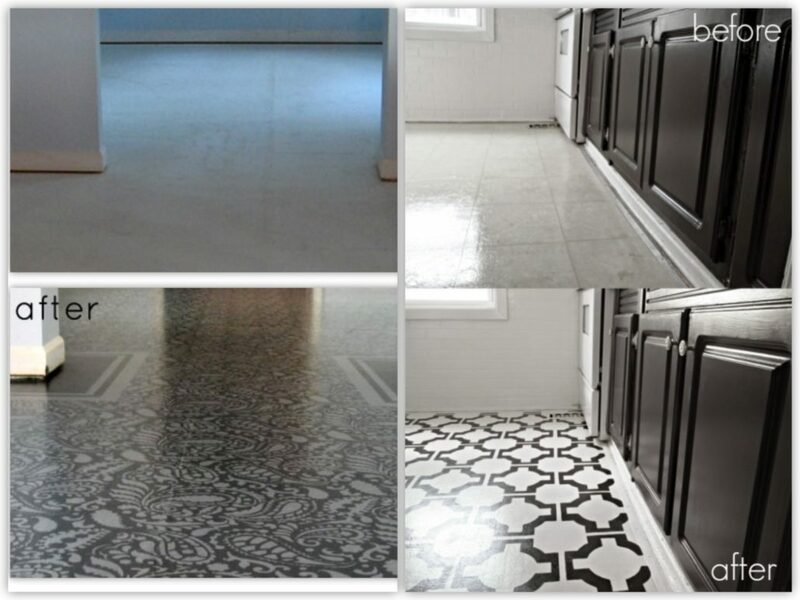 You can do a gloss black or matte charcoal or even white stencilled floor, depending on your style, and we can make it look intentional and fabulous. Throw a LARGE, low pile rug over top of the floor, and you can create a stylish look, for about $200 per room, instead of $1500+ per room for wood. In older homes, you might rip out the carpet and find old parquet flooring, which is a real gem – whether it’s damaged or not. If worn out, glue in any loose pieces, sand or fill any rough spot and get painting. Here is an article by MyLove2Create and YoungHouseLove about the steps they took to prep and paint a subfloor. 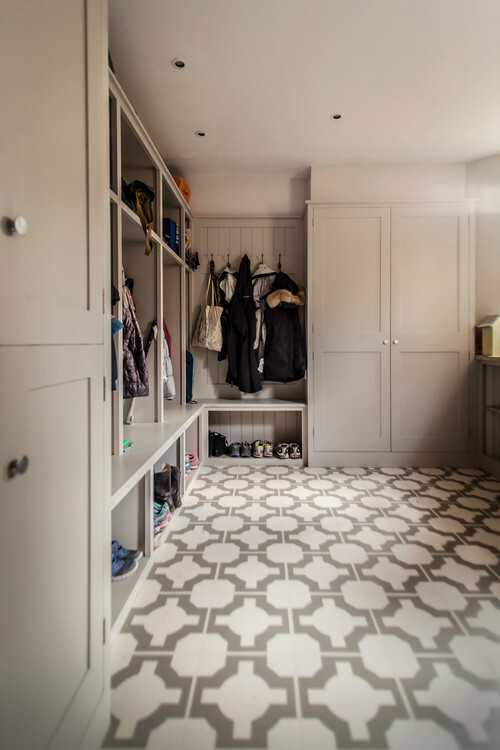 This article by LovelyEtc explains how well her painted floors have held up even 3 years later. 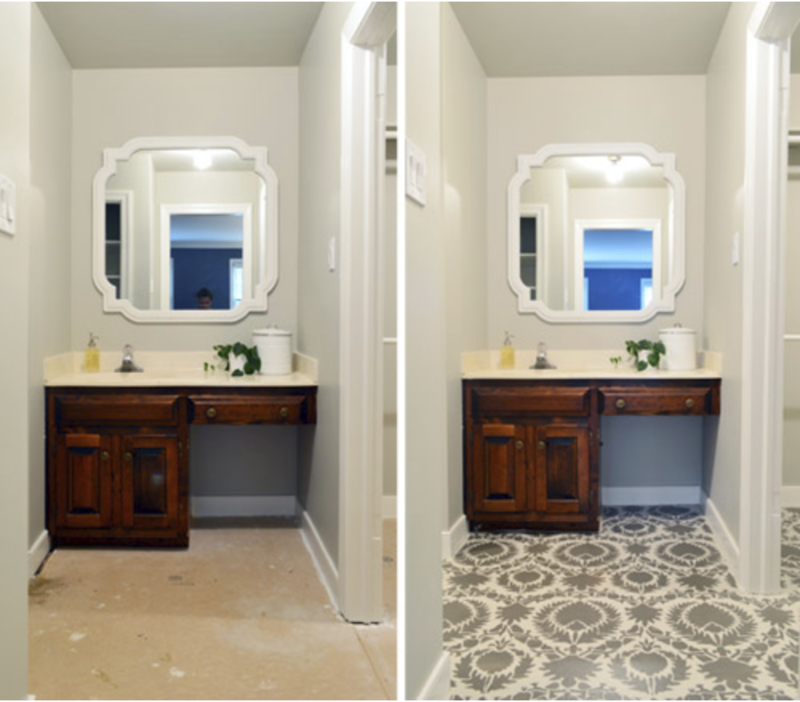 Here is another article by LovelyEtc that reviews painted subfloors, worn out wood floors and tile floors. We truly have the technology and product now days to create a finish that will last. You will have immense pride in your finished product and get connected to your home in a way you never imagined. No matter what is under that carpet, you can rip it off and expose the treads. You might find lovely wood, but more likely, you will find pine or plywood. When I ripped the carpet off my stairs, I found pine, which was a nice surprise. It was never intended to be seen, and was covered with paint and compound and staples from the carpet. With the help of my mom and dad, we pulled all the staples out, and sanded, and sanded, and sanded down to clean wood. Then I meticulously taped out each tread and stained them in the classic medium tone walnut. It was dark enough that it hid knots and imperfections. At first, I was very disappointed to see that 2 treads had a 2 inch groove of wood that chipped off the front edge. But after staining and living with it for a while, it’s just character and doesn’t bother me at all. If you have plywood, fill any holes or gaps in the side so that you have a smooth surface, and paint them black, charcoal or navy. Stairs are often the first thing everyone sees when they enter your house, making them a showstopper is worth every pulled staple. This post from Remodelaholic describes the process of painting the treads, and this article from InMyOwnStyle explains the process for staining the treads. So What Have we Spent So Far? 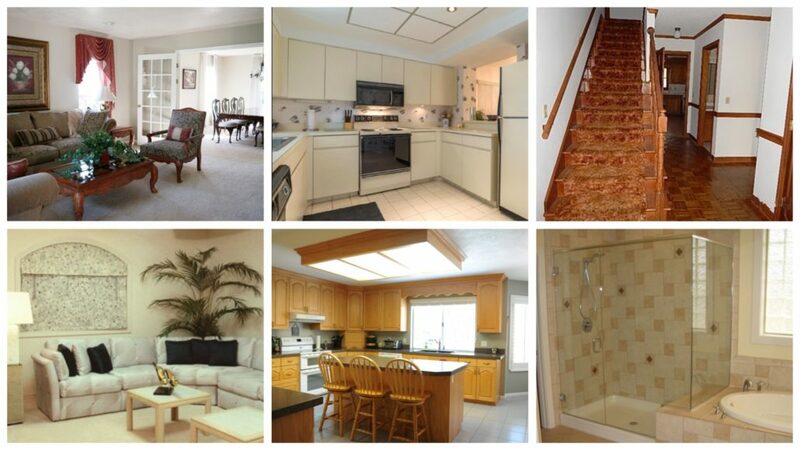 You could transform your new home (in 2 weeks of hard work and help from friends) for about $2500. Yes, not $80,000, only $2,500!! You would have a charming & stylish home that is incredibly livable, and will last for several years, with the occasional touch up. You can plan bigger renovations over 5 or 10 years, without that desperate urge to tear everything out. And while saving for a new kitchen, your big home in the best neighbourhood will continue to accrue more appreciation and equity every day. Your family will have the space and lifestyle you so desperately craved. To me, taking the time to make a great plan, save up some money, asking for help, and putting in some hard work is the best way to get everything you ever wanted. And remember, you don’t have to design and plan it alone. I offer my design services as gift to our buyer clients, and I make a detailed makeover plan that will transform your home with your own personal style. Contact us at any time to learn how we help you every step of the way on your home buying journey. As our buyer clients, we don’t leave you high and dry once you move in. We consider you clients for life, and anytime you need any help, we want to be who you call. 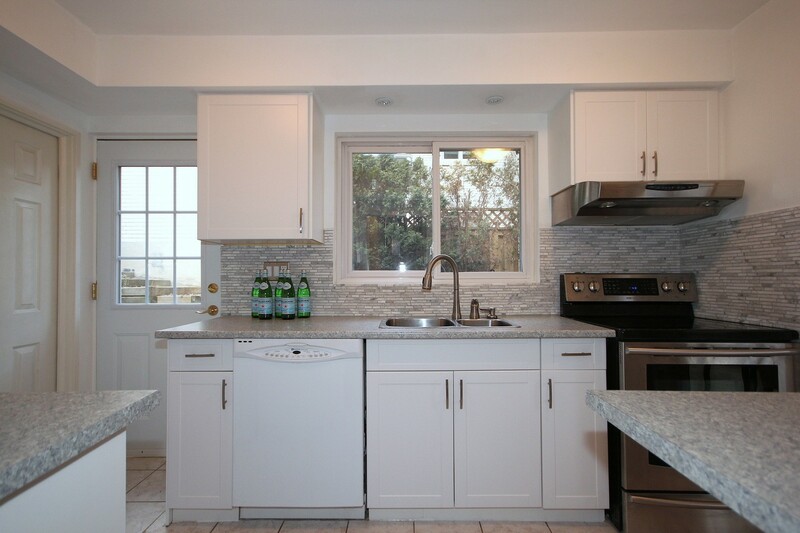 I have perfected the art of getting a high end look for a fraction of the cost, so even when you are ready to rip out floors or cabinets, and build your dream kitchen, I can help you define your ideal style and then build a plan to help you get the highest end look for the lowest possible price. My design consultation is always included as part of your home purchase, which is a real value add. If you have read this far, you are at least a LITTLE interested in buying a diamond in the rough. 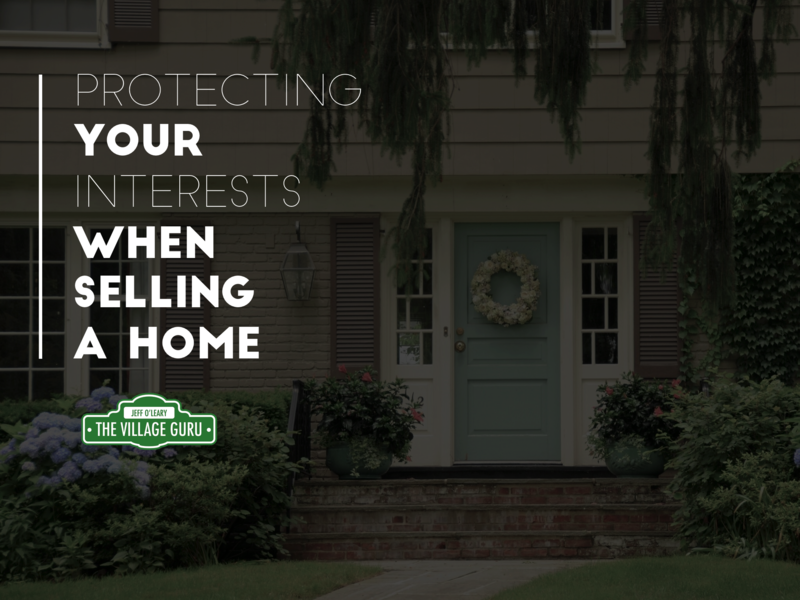 What I always offer – and far too few buyers take advantage of it – is to bring me to a home viewing BEFORE you put an offer on a home. Feel confident about what improvements are even possible in a house and what it would cost. Get the vision before you make a decision. This is the kind of high level service The Village Guru offers, because it’s just the right way to do business. Give us a call or send us an email today to learn what we can do for you, Because “SOLD” isn’t good enough. We want you to expect better service too.